Ping Failed (Average Ping Time: 0ms) What can I do?? Help?! I am sure that the webpage shouldn't fail anything...What can I do to fix this, as I have already tried a few times to publish the webpage and it obviously does not make a difference. That is what I see also...but I went to a website (www.seotoolset.com for the free trial with Try SEOToolSet® for FREE online) that is suggested on yola to check my webpage and its' contents and this is what it said... I won't pretend to know what it means, I can only tell you that it does not sound right. I'm thinking that the Ping doesn't work because their servers aren't able to reach Yola's servers or something. I'm sure that all of your visitors can see your site, though. :) An employee will have more information about this (I am just a Champion). Ok...I hope you are right, becuase I wuld absolutely hate havng spent so much time working on creating this website and then it doesn't work! 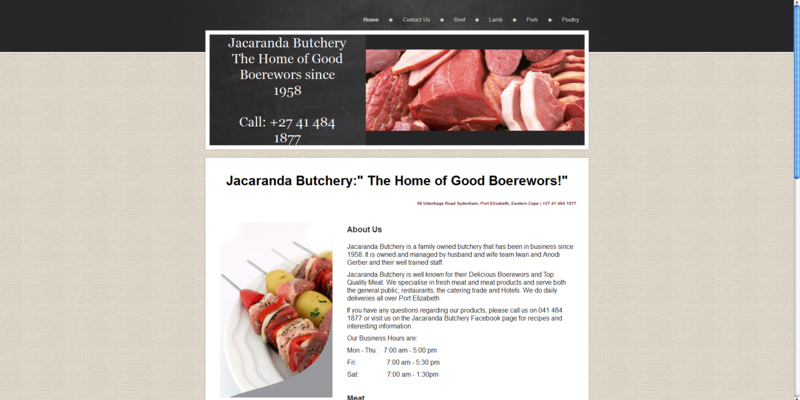 You see this is the first tme that I have done anything like this...and Imust say that www.jacarandabutchery.yolasite.com looks pretty darn good, considering that a total newbie created it! Just so you know, Yola really makes it easy to create a website/page, I tried one other webpage creator and man it was a nightmare...the peole at Yola obviously know what they are doing! Thanks!!! I agree with you, Yola is the easiest to use. There is another one that I once used and it is horrible compared to Yola. With Yola's drag & drop and all of it's other features, it is the best website builder available. :) Your site does look great, well done! A ping test is just a tool to test network connections, it could have failed for any number of reasons the main one being a firewall obstruction. I wouldn't worry about it in the slightest, as Nathan has pointed out we can all see your site and it does look good, well done. Thank you everybody for helping on this thread!